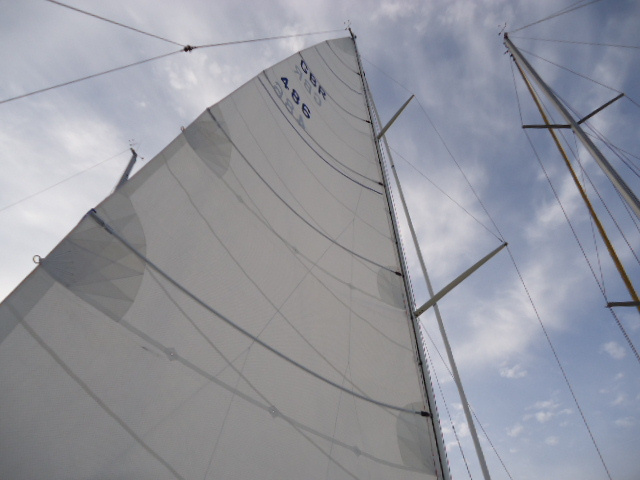 The highest quality dacron sailcloth is required for a durable inmast sail. To much fabric stretch will soon render a poor quality sail difficult to furl as the extra fullness generated refuses to roll neatly into the mast, larger yachts can benefit from a triradial cut sail with taffeta mylar fabrics this allows weight reductions and lower stretch under high loads. Where improved performance is required, vertical battens can be fitted to the leach so that the roach can be extended. For yachts over 30 feet, 1.5oz nylon is recommended, narrow head angle for stability and reaching ,triradial cut for strength, high clew for easy gybing. Area is custom designed depending on use, ie UK waters ,the med, or transatlantic, but most are about 85-90 % of the full size spinnaker area. A popular consideration for mainsail shape control in heavy weather and ease of packing away for yachts with high or out of reach booms. fully battened mainsails have 5 battens running luff to leach parallel to the boom, bolted on sockets for the battens spread the load onto the sail at the leach and to the car at the mast, there are 4 quality systems for the mast cars that will fit a standard mast without additional track, rollerball (Frederiksen), wheeled (Selden and Rutgarson) and low friction plastic (Bainbridge Sailman). all these systems transfer the batten compression loads to the outside of the mast track (normal slides only work under tension) without one of these car systems the sail will tend to jam hoisting or lowering. sail design for fully battened systems makes use of the fact that the battens control the sail shape rather than the shape put into the sails panels, to this end a very flat sail shape that matches the working mast bend is used, the batten type (round or flat section) is selected to produce the best shape at each batten height, stiffest battens in the lower third of the sail, softest at the top. if the battens are incorrect so will be the sail shape. 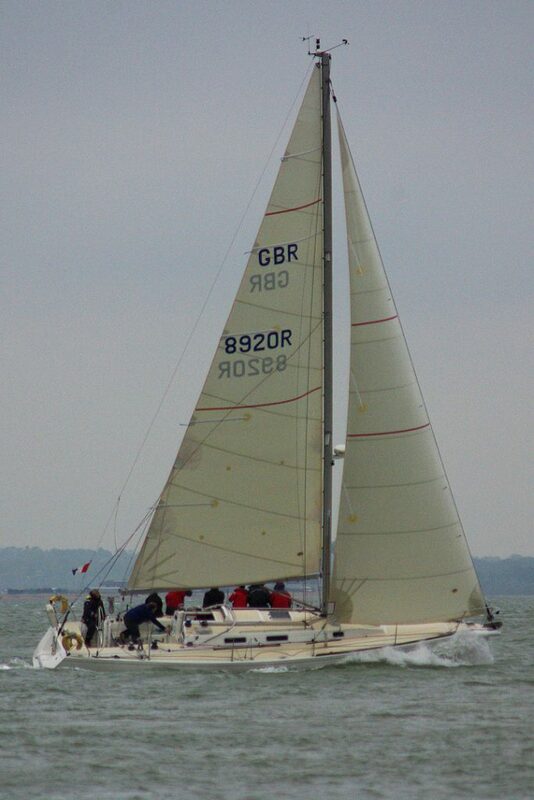 Purpose built running spinnakers are very useful for long distance sailing .set with a pole ,when the cruising chute is at its least effective, the sail is cut to be stable with curved shoulders for minimum trimming and high clews for visibility. area 10 to 20 % larger than cruising chute works well. Again the best premium dacron to control sail shape and extend life is used, most cruising rigs work best with flat sail shapes that stay flat when furled. 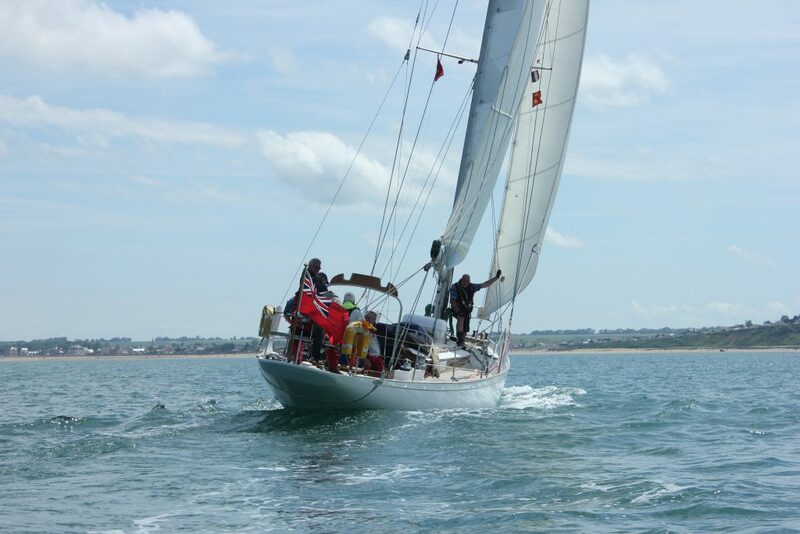 For extra performance or for IRC racing (furling rating allowance) genoas, mylar film based sail fabrics are recommended these sails can be fitted with roller battens if required. The last 10 years has seen a steady decrease in genoa overlap at the mast, this has the benefits of much easier tacking and winching in together with better forward visibility. The best area for a sloop rig is .05 times the mast height squared, this is the RORC offshore maximum size and has shown to be usable in all winds yet with sufficient power to pull you to windward if required. 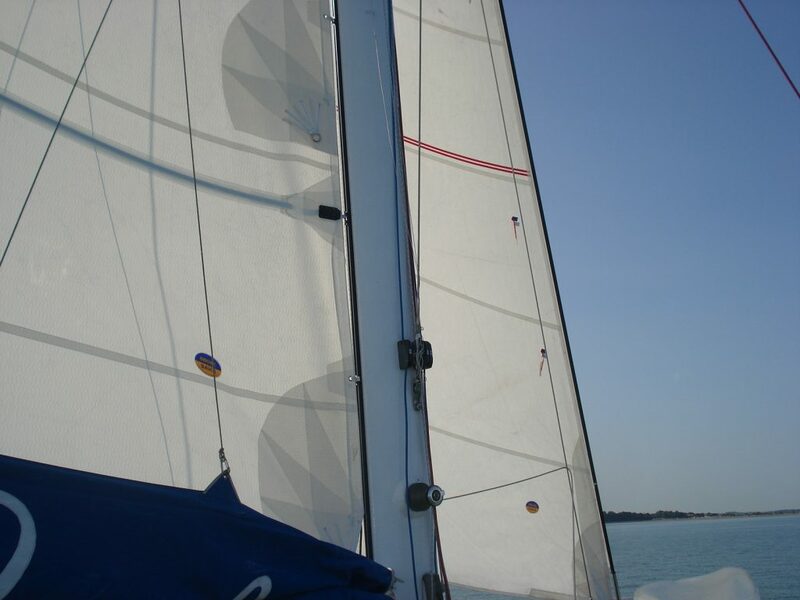 various methods of attachment are used depending on genoa handling system , to work with a furling gear , eyelets are fitted as well as luff tape and or a dynema (high strength) rope so the sail can be set flying with a tight halliard or laced to the furled genoa with sail ties, if an inner forestay can be fitted (the best setup to have )hanks are fitted. the best sizes for a trisail are 66% of the mainsail foot by 50% of mainsail hoist ,the sail is cut with a high tack so it can be attached and hoisted above a lowered mainsail and sheeted on the toe rail aft of the cockpit.